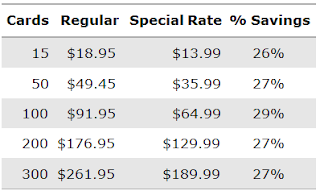 Notice the Special Rate Column? Now through February 9th you can still spend WAY too much for shipping but at least it's some savings. I mean are they serious? $189.00 to ship a 300 count box of cards and regularly $262? Are they hand delivered by the ghost of Arthur Shorin himself on a silver platter and individually encased in lucite holder embossed in 24K gold with the players name, IPO run, etc? Why do I know this? Becasue I wanted to take possession of my Walter Payton card. I missed out on the IPO (the print run is 999) but I picked one up on eBay for $16.50. Probably over spent but compared to other cards sold to date this was a pretty good deal and I REALLY wanted this card. Oh and after all that, the cards aren't available until April 9th. Hey, I like this smarterdeals.com guy. He's hilarious. As far as the shipping rates go, do you have any idea how in the world they come up with that? Is it $.90 a card or something? That's ridiculous. While this is ridiculous, if you have a Topps HTA store within even a 30-40 mile drive of you, it's WAY cheaper to get them shipped there. Now, I'm not one to defend eTopps in every case, but there's some support to what they've indicated for shipping. I've been doing eTopps since '02, and have taken delivery of some cards at least once a year since '04. Keep in mind that every card comes in its own plastic case and baggie, and they often pack several at a time in another bubble mailer to prevent shipping damage. This is much more like shipping 300 graded cards, in terms of shipping box size and weight, and not a little dinky 300 count box of standard cards. If all you want is the Walter Payton classic (which is a card I have and enjoy also, IMO), then I suggest taking advantage of what halloffamehawk said, or find the cheapest delivery method (USPS?) available from eTopps directly. You may not even need the minimum count of cards for this shipping deal, if all you really want is one. The upper end of that scale seems high to me, but the lower end of the scale for the shipping special (of which I did the 15 card deal) is reasonable enough. Etopps orders are fufilled by a third party in Delaware and shipped via UPS. There are set costs into delivering your Walter Payton card. The cards are encased at the fufillment center, given autheticity stickers, and sealed with a topps holo. It appears you live in Chicago. There are THREE Topps HTA stores that are set up to recieve eTopps shipments in the greater Chicago area. The cost is 65 CENTS per card. Topps ships out eligible orders once a month, but it's the cheapest alternative to paying up the wazoo in shipping.